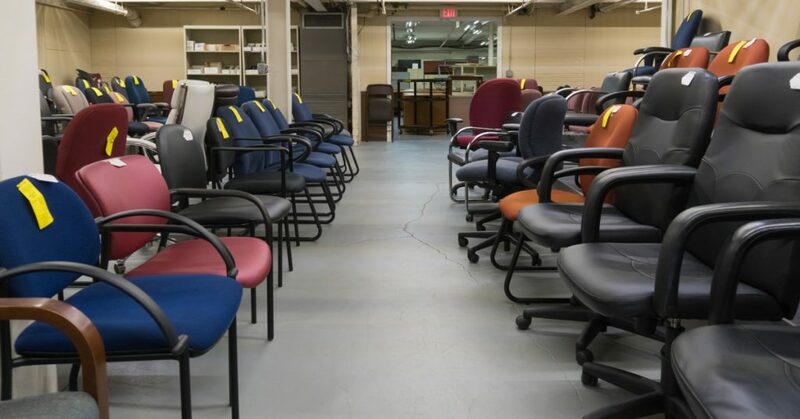 If you need new office furniture but you’re on a tight budget, come take a look at (and test) our wide selection of preowned office chairs. We’ve got a sea of seats to fit all types of keesters! Your office chair should be like your spouse–it should support and comfort you. Blending with your personality is a bonus that can also perk up your workspace. Choose a chair that adds a splash of color to the room or matches your motif, something that lightens the mood and makes your time working at home less daunting. Bring comfort to your office environment. Going through an office remodeling project? It’s important to choose the right office chairs for your employees to create a more ergonomic work environment. We know not every rump is the same, and that’s why we are more than happy to help you choose the furniture best suited for your able-bodied crew in person. We’ve got preowned office chairs for every room, from the boss’s office to the conference room to the reception area. Can’t bring the whole crew? No problem! We’ll deliver any preowned office chairs right to your location so your team can test them in their natural habitat. If you’ve recently hired a new guy, with all the hustle and bustle and paperwork, you may have forgotten to pick up a more suitable chair for his workstation. Don’t force him into a smelly, worn computer chair too small to satisfy his comfort. At Nolt’s Office Furniture, our office chairs suit every budget and body type. If you’re looking to furnish your sitting area, you’ll find we can help with that, too, no matter your budget. Whether you run a law firm, doctor’s office, or marketing company, you’re sure to find something to your liking in our selection of quality seats. We’re always rotating our stock, too, so swing by our Ephrata showroom as soon as you can. You never know when you might miss out on some of our comfortable preowned office chairs.